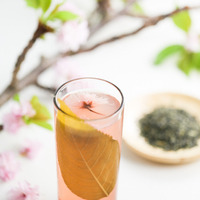 A remix of DB Liquids Black Blossom Tea and my attempt at a Cherry Blossom Iced Tea. Don't be alarmed by the flavor percentage. The TFA I'm using here is super weak (especially Sweet Tea). When ID10-T turned me onto TFA Sweet Tea I knew that I had the base for this remix. It's really weak and you can probably push it up to 15% solo. The generic watered down restaurant iced tea it pushes is light and doesn't bully a mix like FA Black Tea would here. TFA Honeysuckle/Cherry Blossom brings the cherry with some floral brightness. The Honeysuckle pushes it a little sweeter and adds some depth to the florals. I tried it without the Honeysuckle but something just seemed to be missing. CAP Hibiscus is here to add a bit of it's renowned sticky mouthfeel and add to the sweetness. The small amount of FE Lemon brightens things up just a little bit and isn't really noticeable in the recipe. Can't have iced tea without just a little lemon. INW Natural Mint adds just a touch of cool natural mint to the profile. It's sits way on top and is just noticeable. Add coolant if you wish. I like this with just the mint. It's a pretty delicate vape even with the high flavor percentage. This is delightfully different! Admittedly it might not be a flavor for everyone but it was right up my alley! Some people like florals and some don't. If you like floral teas then you should really give this one a try! I thought it was going to be much more floral heavy than it turned out to be. It reminds me of an oriental type of tea. Love it!